On March 28, 1942, an elite but untested force of British Commandos conducted one of the most daring raids ever attempted behind enemy lines during World War II. It happened at a critical moment of the war, as France had recently fallen to the Nazis and Britain was losing the Battle of the Atlantic. The St. Nazaire Raid, known as Operation Chariot, was an amphibious attack on the heavily defended Normandy dry dock in German-occupied France. The goal was to destroy the only Atlantic coast facility large enough to accommodate Germany’s massive new warships. A successful result could theoretically put the Germans out of action in the Atlantic for the remainder of the war. The audacious plan called for a retired destroyer, the HMS Campbeltown, to cross the English Channel accompanied by 18 smaller craft manned with specially trained Commandos. Packed with 4.5 tons of delayed-action explosives, the ship would ram the Normandy dock gates, where the explosives could do then their work. Under cover of night and disguised as a German destroyer, the Campbeltown managed to sneak by outlying artillery gun placements. Making its way up the River Loire, however, the ruse was soon recognized and significant German defenses were unleashed. Amazingly, the Campbeltown survived the onslaught and sped toward the dock. 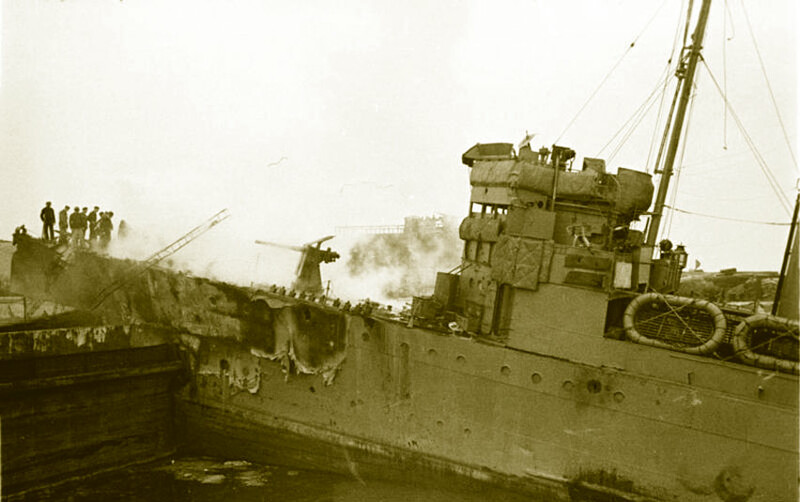 The smaller craft did not fare as well, with heavy German gunfire destroying nearly all the boats and their crews. At 1:34 a.m., the Campbeltown struck the dock gates at 20 knots. The surviving Commandos, numbering only about 100 by this point, disembarked and began destroying nearby buildings and infrastructure. They faced a force of 5,000 German defenders and, with little firepower or defensive equipment, many met their ends during this effort. Those who hadn’t been killed or captured began to wonder why they hadn’t yet heard the Campbeltown explode. Had all their efforts and sacrifice had been in vain? As the Germans rallied and began capturing and interrogating prisoners, the Campbeltown did finally explode at 10:35 a.m. The massive blast killed 250 German soldiers and caused enough damage to the dock to prevent its use for five years to come. Only 228 men of the initial Commando force of 611 returned to Britain; 169 were killed and 215 were taken prisoner. German casualties numbered over 360 dead, with about 250 killed when the Campbeltown exploded. 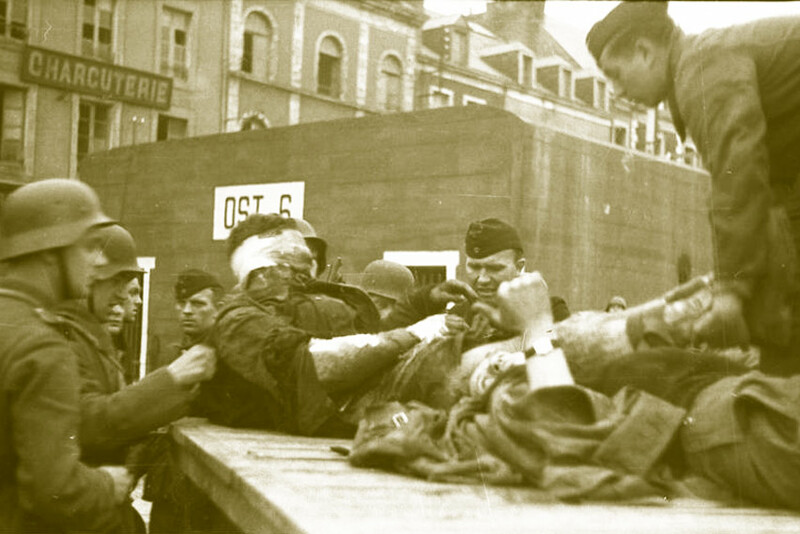 An unprecedented number of decorations were bestowed on the brave Commandos of the St. Nazaire Raid, and it has since been dubbed the “The Greatest Raid of All” by military experts. Given my frequent consumption of WWII history documentaries, I’d heard this story many times before. But in the documentary series “Behind Enemy Lines” (now on Netflix), I heard the account from a new perspective — specifically, via direct interviews with the soldiers who actually conducted and survived the campaign. In their stories, surviving veterans tell of coming close to death countless times during the effort. 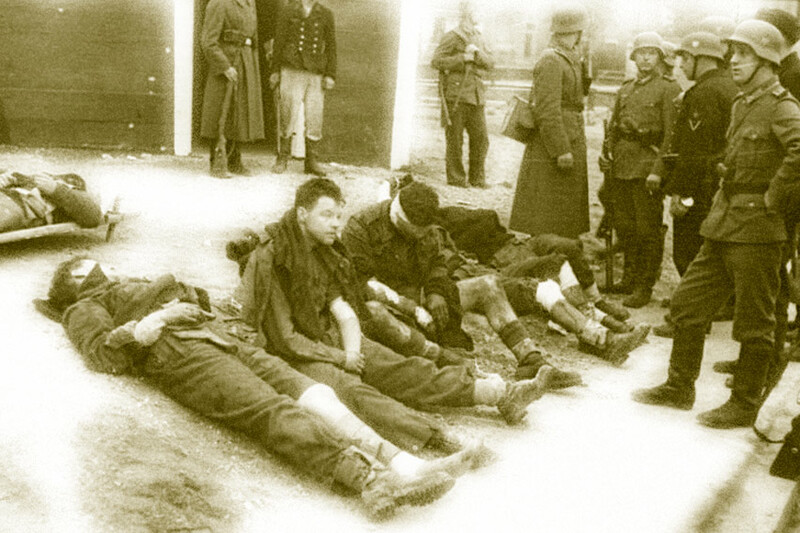 Many were actually shot or wounded by shrapnel and left for dead by their comrades. One tells of slowly regaining consciousness after being shot, only to find two German soldiers discussing whether to put a bullet in him to ensure he was dead. Finally, one German convinced the other it was pointless because the Englishman was obviously already dead. In addition to being awed by the courage and resolve of these men, one thing in particular struck me. All the British veterans said that in the most critical moments of battle, they realized it might be their time to die, and if it was, they were ready. If they survived, they wanted to make their lives matter and complete their mission. If they didn’t, they accepted it was just their time. I’ve been thinking about death lately. I suppose some of this has to do with rapidly approaching the age of 50. The other reason is that this week marks the first anniversary of my mom’s death. Last September my mom suffered a major heart attack at age 85. It came on suddenly and without any of the usual warning signs. In spite of some glimmers of hope, she died a few days later in the hospital. It was a whirlwind of activity and emotion, as I suppose it always is when losing a parent. Looking back, I could say she died too soon, because she had mostly been in good health. Had we diagnosed the heart issues earlier, she might have lived another 5-10 years. But the truth is, she was increasingly suffering with dementia and pain, and it was clear to me she was enjoying life less and less as the days passed. She had lost my dad six years earlier and I knew she also felt lonely much of the time. So maybe her death wasn’t too soon. Maybe it was just right. Last week I dreamed I was driving along a curving elevated overpass. I needed to slow down to make the turn, but instead of hitting the brake I found myself inexplicably pushing down the accelerator. And I couldn’t stop doing it. The wall of the overpass approached faster and faster until the car finally crashed through, sending me flying out into empty space. Looking down, I could see roads and cars far below me. As the ground approached, I kept thinking through ways I might survive this. Maybe I would land on another overpass, or maybe I’d hit water (even though neither of these things was in sight). I finally realized there was no stopping it. Like the soldiers, my thought in the dream was, I don’t want to go now, but if I do, here we go. Let’s see what the universe has in store next. The next morning, as I reflected on the dream and my mom’s passing, I began to realize something: There is no dying early. And in fact, when we live as those soldiers did in the heat of battle, there’s really no dying at all. There can be no death at all as long as we’re truly living in the current moment. I recently finished Jack Kornfield’s uplifting book, After the Ecstasy, the Laundry: How the Heart Grows Wise on the Spiritual Path. When we really think about the nature of our existence here, and how limited and brief it is, it becomes clear. Life is not about pursuing pleasure. It’s not about success or accomplishment. It’s not even about living a long time. Our experience here is about discovering and embracing the unfolding mystery of life, moment to moment. Mystery is so ever-present that no one can know for certain what will happen one hour from now. From mystery’s vantage, there is no fixed path. In truth, there is no path at all, for that would be to place it in the realm of space and time. Yet space and time too are a mystery—the past already disappeared, the future only imagined, and the present as fluid as water. To awaken is not to fix or hold, but to love whatever is here. Knowing this truth releases our hearts from grasping. The mystery that gave us birth becomes a dance. We can’t know what will happen in the next hour or even if it will be our last. The soldiers at St. Nazaire certainly couldn’t. Yet they chose to live their current moment to the fullest extent possible, and make it count both for themselves and for future generations. The key is to welcome the mystery and live life to the fullest right now. Accept time and space for what they are — simply the things that keep our universe ordered and time flowing in one direction. The only thing we truly have control over is what we do right here, right now. When we “love whatever is here,” we’re released from worry, fear and uncertainty. There is no dying early. Only right now matters. In my dream, after flying through the air in the type of slow motion that only happens in dreams, my car finally crashed to the pavement. For whatever reason, I hadn’t died, and suddenly the dream reset to something new. I don’t know what it was trying to tell me (if anything) but I do appreciate how the dream reminded me that there’s only one current moment and that I have to make the most of it. One way I’m planning to do that, while also dealing with my fear/fascination with death, is to serve as a hospice volunteer. I’ll write more about that experience as it unfolds.